In 1985, Portland French Bakery opened with an original concept: seven-day-a-week delivery of handcrafted breads into local supermarkets. Today, we continue our daily deliveries of old-fashioned, fresh-baked breads to a diverse following of customers, including retail stores, warehouse outlets and restaurants. 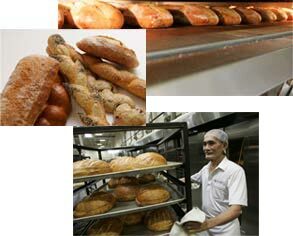 We offer a unique combination of the slow, time-tested processes of artisan bakeries and the fast, reliable service of larger wholesalers. While we now produce over 400 customized bread products, we still rely on 120-year-old sourdough starter for our signature City Sour products, as well as an authentic, hands-on baking process. Our bakery has grown, but our mission remains the same: to deliver quality and service to our customers and community. We deliver the highest-quality breads, superior service and a community spirit — all the ingredients our clients have come to expect. © Portland French Bakery 2006. All Rights Reserved.